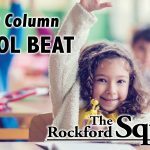 In the past few months as many adults were struggling with sticking to their New Year’s resolutions, a group of Rockford fourth-grade students were presented the opportunity to resolve themselves to making a difference in the world. Their task was to take two dollars and use it in some way to change the world. 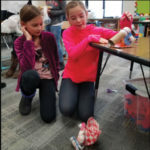 Students were to create an action plan, independently or with a group of other students, and share it with their parents as to who they were going to use their money to change the world. Students brought their plans back to school to share with the class. Over the next few weeks they enacted their plan to reach their goal. Within their plans students were to identify a charity to which their efforts would benefit. Local organizations like North Kent Community Services, Crash’s Landing, and Helen DeVos Children’s Hospital were beneficiaries of the students’ generosity. Other beneficiaries include national charities like the American Heart Association and Ronald McDonald House. Some students decided to act more locally and contributed to a child’s double lung transplant. Some students promoted “change wars,” others sold homemade candies, yet others asked friends and relatives for donations to add to theirs. One group of boys pooled their money and purchased colored string, which they fashioned into “friendship bracelets” that they sold to friends at church and sporting events. They raised over three hundred dollars to donate to the Special Education Advisory Council to benefit their efforts in our community. While the fundraising efforts were impressive, the real impact was not monetary. It was the lesson learned in conducting such an endeavor. This is simply expressed by one student’s efforts to use the two dollars along with his allowance to save up to buy a shovel to help the elderly neighbors with their driveways. A very involved grandparent approached me the other day to thank me for the work of the fourth grade that chose to take on this project. He was not only impressed with the lessons that were learned in the planning and enacting a plan to benefit charity, but the lessons in making a difference and learning that there are worthy causes helping others less fortunate than ourselves.